The Tunic is simply made like a pillowcase, with slits for the head and arms. The raw edges are simply turned under and whipstitched. 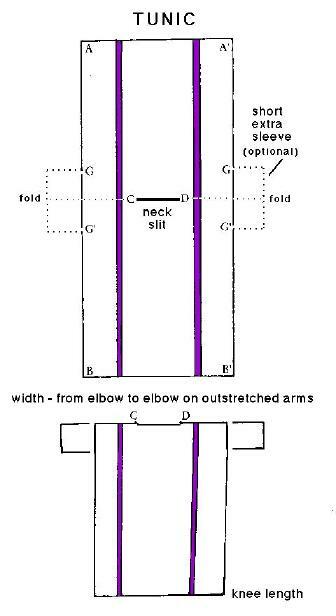 The Equestrian (noble) class had 2.5 cm purple stripes on their tunics, and Senators had 7 cm wide purple stripes. Optional sleeve extensions are also shown. A belt was worn to gather the loose material. The length of the hem increased for the noble classes, note the short tunic worn by the slave above. Note - side slits at the lower hem may be necessary for freedom of movement. A Roman man would not step outside in just a Tunic. The Toga was the proper dress for a Roman citizen. The average man's Toga was always white, purple borders were added for boys, and for the Senatorial class. The Toga's size depends on your height - the figures above are given for the typical range of heights. Draping the Toga is something of an art (see above), but there will be people at the shoot who can help first time wearers.